This is the program that I preserved from the event. It was contained in a boxful of musical artifacts that my mother sent me. 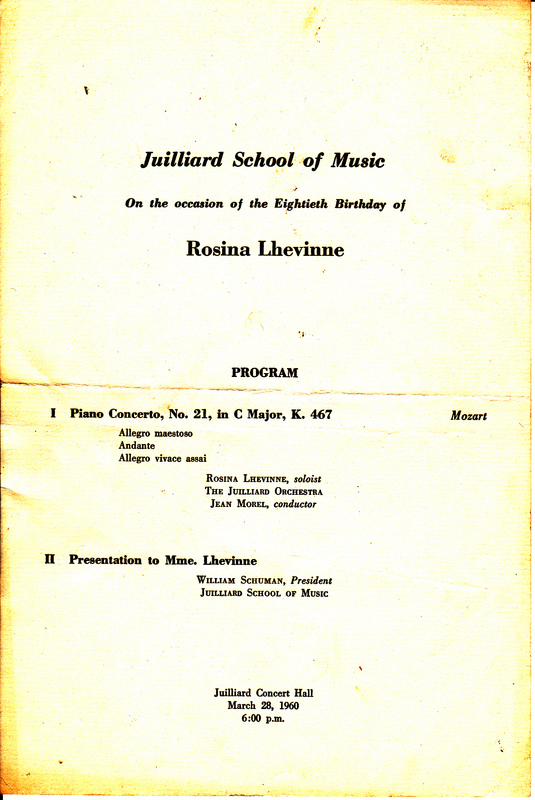 On March 28th, 1960, I was present at Madame Rosina Lhevinne’s Eightieth Birthday celebration concert held at the Juilliard School, and it was an evening to remember. I received the ticket compliments of Lillian Freundlich my piano teacher, through her husband, Irwin, who was then Chair of the Piano Department. 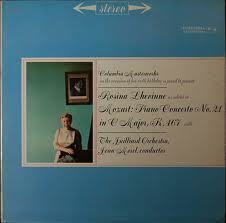 Jean Morel conducted the Juilliard Orchestra as Lhevinne played the Mozart Piano Concerto No. 21 in C Major like an angel. In the audience were many of her students including John Browning and Lee Luvisi. I’m not sure if Van Cliburn made it to the event, but there was a tribute to the pianist given by William Schuman, President. Years later when I arrived at the Oberlin Conservatory, I discovered a recording on vinyl of this very concert in the Con Library. It re-awakened the magic of the ageless pianist’s memorable performance. Sparkling passagework was cloaked in a beautiful singing tone, and if I had closed my eyes, I would have imagined an effervescent young pianist in the throes of musical passion. I discovered a You Tube re-visit of Lhevinne’s Juilliard concert, 3rd Movement, Mozart 21. (recorded “live”) Keep in mind that she was 80!!! “Rosina Lhevinne’s remarkable solo performing career began at age 75 and climaxed at age 82 when she made her spectacular debut with the New York Philharmonic under the direction of Leonard Bernstein, playing Chopin’s Piano Concerto in E minor.